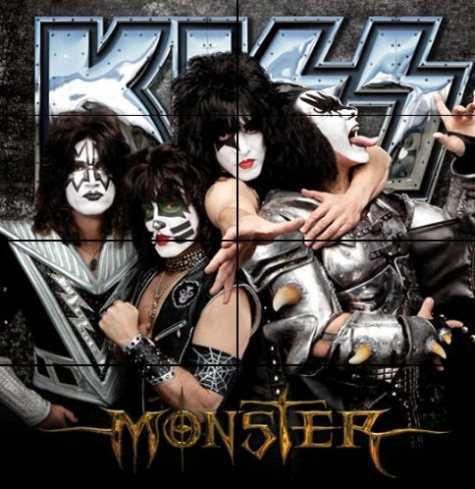 KISS will release their 20th studio album, “Monster,” on October 16. The band has revealed the cover for the project, which was unveiled piece-by-piece over the course of the past week. Using the group’s recently launched "Monster Hunt" Facebook app, the classic rockers have been exposing portions of the image at various web sites around the Internet so that fans could put it together themselves. The full image can now be seen below. "Monster" is KISS’ first studio effort since 2009’s "Sonic Boom"; it was produced by Paul Stanley with Greg Collins at Conway Studios in Hollywood, California, and The Nook in Studio City, California. The album features collaborations among all four KISS members — including co-founders Stanley and Gene Simmons, and longtime members guitarist Tommy Thayer and drummer Eric Singer. The album’s first single, "Hell Or Hallelujah" is out now. KISS are currently playing shows across North America with Motley Crue.